All the new specifications include “measure the internal resistance of a cell” as one of the practicals. This is probably a new bit of physics for your students, and although the practical is straightforward to set up, collecting and processing the data is more of a challenge. Comparing two different types of cell, as shown in this film, can make the practical more interesting, with potential for differentiation by ability. The film starts (to 1:24) with the theory which you’ll probably introduce to students before carrying out the practical. From 1:30 onwards, the film illustrates how you might go about conducting the practical with conventional cells, and also with a button cell (watch battery). Christina and Alom do several things in the film to limit the current so the cell doesn’t overheat: they use a limiting resistor, start with low currents, and connect the circuit only momentarily. This represents safe working practice, but heating the cell would also affect the resistance we’re trying to measure. We used a 10 Ω resistor to limit the current in the circuit. A simple fixed resistor would do, but make sure it can handle the maximum power you expect in the circuit – a few Watts. We didn’t have such a resistor to hand for filming, hence the huge switchable resistance box. To vary the current to get multiple readings we used an old rheostat, rated at about 16 Ω. In practice anything with a range up to 50 Ω or so should work. It’s also possible to use a range of different fixed resistors, or a switchable resistance box. Digital or analogue voltmeters or ammeters could be used instead of multimeters, but as Christina points out in the film, the use of multimeters is a skill your students will need to develop anyway. Students will need to select the most appropriate range, which is likely to be 20 V DC for the voltmeter and 200 mA DC for the ammeter (taking care to convert back to amps when processing the data). Working in pairs, this experiment can be be done very quickly. Systematic data are nice, but as long as there’s a good spread of data points across the whole range of currents, students should get a good result. We would normally expect an AA cell to have an EMF of about 1.5 V and an internal resistance of about 1 Ω. Ours was old and cheap, which probably explains our results: it’s worth noting that poorer-quality cells can make for a more interesting experiment! Is their result what they would expect from the cell packaging or label? How could they assess the uncertainty in their data? Christina mentions tolerance at 4’11”, which is a concept with which students may not be familiar. All components have a stated manufacturer’s tolerance, which notes the ±% range which might be expected when the component is in normal use. Taking photos of the meters is one way of dealing with rapidly-changing readings. Another approach would be to use analogue meters, which can be easier to read by eye. With the increased uncertainty in the readings, Alom suggests repeating the whole experiment twice. Each repeat could be plotted onto the same axes and the gradients and y-intercepts compared. Students could then find the mean EMF and internal resistance, together with their associated uncertainties. 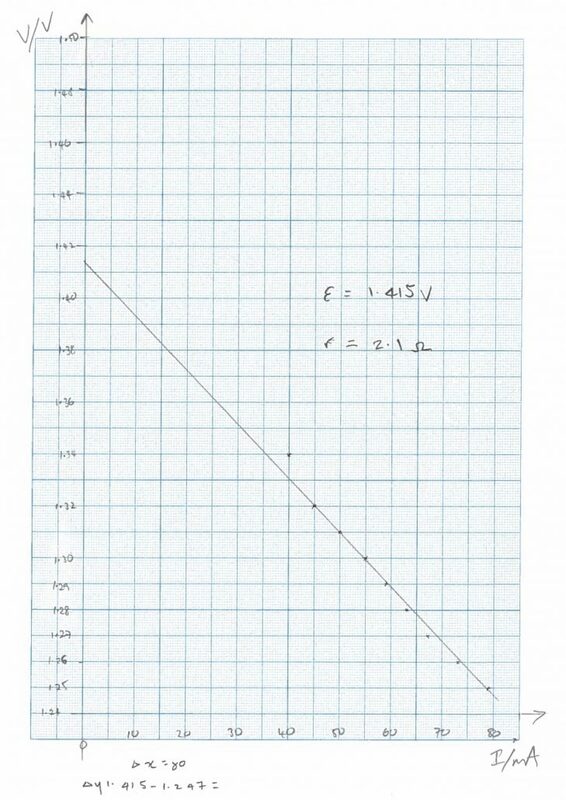 We would normally expect a 3 V cell to have an EMF of about 3 V, and an internal resistance which is much higher than the AA cell – which indeed is what we found, measuring an internal resistance of 15 Ω. Is there a better way to record the fluctuating readings? Is a simple mean a legitimate way to combine repeat readings? 50 AA cells should cost about £12. 40 3 V coin cells should cost about £5. Some teachers like to challenge their students further by investigating the EMF and internal resistance of a cell made with copper and zinc electrodes and an item of fruit or a vegetable, for example: a ‘potato battery.’ Further guidance on this can be found at the Practical Physics website. Cutting the potato into different shapes can make for an interesting comparison. CPAC 4: Makes and records observations. Makes accurate observations relevant to the experimental or investigative procedure. Obtains accurate, precise and sufficient data for experimental and investigative procedures and records this methodically using appropriate units and conventions. You can likely prioritise other CPACs should you so choose. There are some more notes on this in the draft student worksheet, below. EMF and internal resistance worksheet (Word .docx). As ever, no single film can encompass everything one might wish to say about a practical. Please, leave comments with your thoughts about the approach we’ve taken, and your suggestions for alternatives or improvements.